Despite the name Chocolate Viennese Whirls, there’s nothing remotely Austrian about these biscuits. It’s also quite interesting that no one seems to have taken responsibility for creating them. Traditionally they are made with a vanilla biscuit and sandwiched together with jam and vanilla buttercream. Mr Kipling has become synonymous with Viennese Whirls. Generally people don’t make their own when you can buy pretty tasty ones for such a tiny amount of money. However like nearly everything, they taste so much better when they’re home made. I had no intention of ever making Viennese Whirls, they weren’t even really on my radar. Then about a week ago, I had a total ‘fangirl’ moment, when not one but two of my favourite Patissier-Chocolatiers William & Suzue Curley, both followed me, (ahem yes me) on twitter. As if that wasn’t enough to nearly make my head explode, Suzue then replied to one of my tweets, where I asked for ways to use up cacao nibs. She very kindly offered me a copy of their book Couture Chocolate for free as it featured a number of recipes using them. When my signed copy arrived, I baked something from it that day! I didn’t have all of the necessary ingredients to make any of the cacao nib recipes. 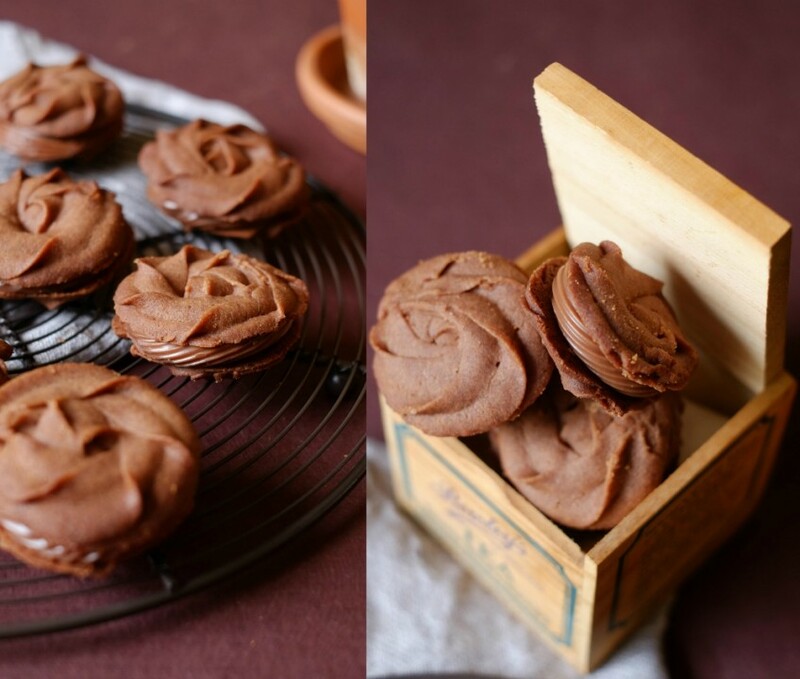 I did have everything to make these Chocolate Viennese Whirls (in the book they’re referred to as ‘chocolate rosettes’), if I adapted the recipe for the ganache filling. The original recipe used a cinnamon ganache, I changed this to a hazelnut ganache, made using Amedei Toscano Nut Brown Gianduja mixed with double cream and butter. These are so simple to make, you should definitely give these a try over the summer holidays if you want a tasty stress-free bake. 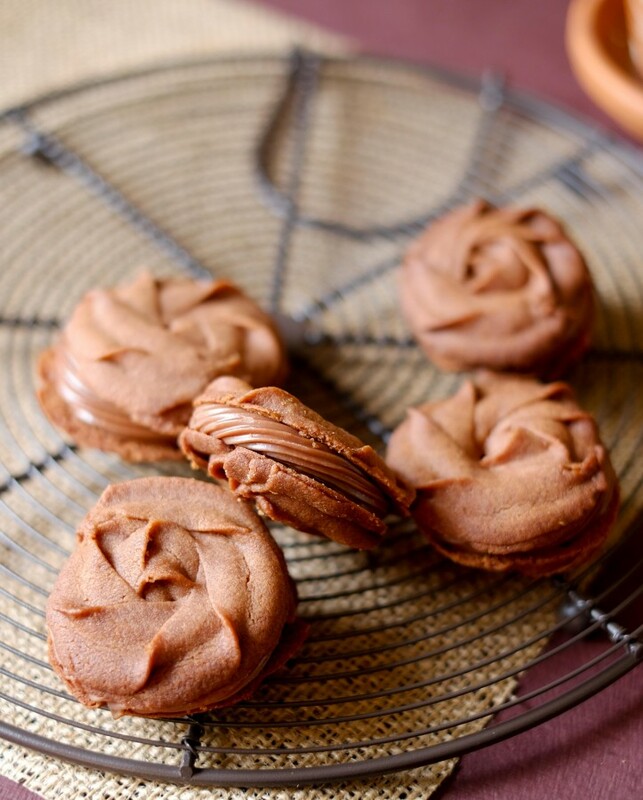 I baked these Chocolate Viennese Whirls, using a fantastic baking tray sent to me by Utensa Ltd, they’re a British Bakeware manufacturer. It’s so lightweight, but produces a really even bake. I personally hate really heavy baking trays and pans as they end up hurting my wrists, this one was great. They also sent me an equally fantastic cake tin, I used it to bake a fabulous chocolate cake! However I was too impatient with the cake, I cut it in half while it was still warm. When I tried to separate the two halves the top layer split in three and no amount of butter cream repairing could patch it back together. Safe to say that one won’t be on the blog, not because I don’t want you to see my failures, but because it was actually such a mess, I didn’t really think anyone could learn anything from my posting, except to maybe have more patience! 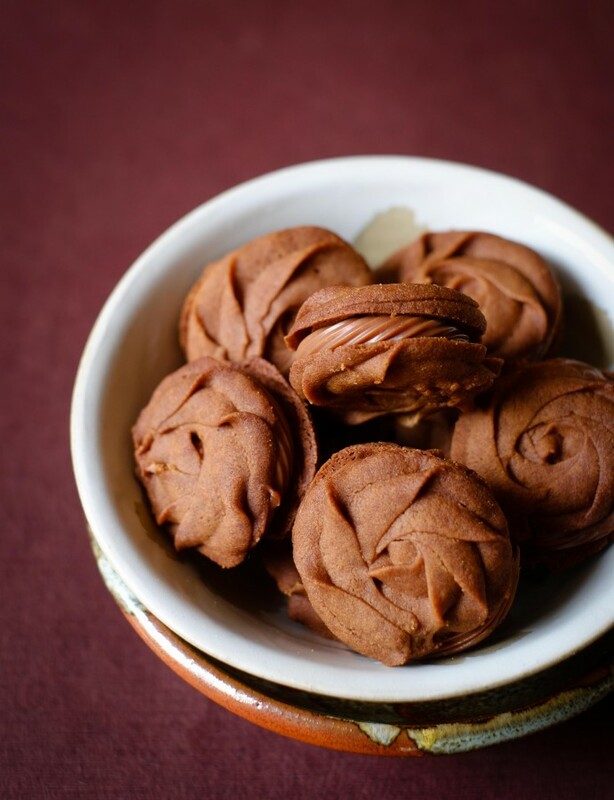 A recipe for crumbly chocolate biscuits, sandwiched together with a rich Gianduja ganache. First make the ganache, so that it has time to cool. Place the chopped chocolate into a bowl large enough to fit the chocolate and cream. Bring the cream to the boil in a saucepan, remove from the heat and allow the bubbling to stop, so that you don't risk scorching the chocolate. Pour the cream onto the chocolate and stir until it's melted and evenly mixed. Add the butter and stir until all of the butter has melted. Cover the ganache with clingfilm, making sure it touches the surface, so that you don't get any condensation. Place in the fridge to cool. You don't want the ganache to set hard, just be firm enough to pipe or dollop. Preheat the oven to 160C Fan/180C/350F/Gas 4, line two baking trays with greaseproof paper or use a silicone baking mat. Put the butter into the bowl of a food mixer and beat until it's soft. Add the icing sugar and beat until light and fluffy. Gradually beat in the milk and then mix in the flour and cocoa powder. Spoon the mixture into a piping bag fitted with a 10mm star piping tip. On the prepared baking tray, pipe the dough into 28 3.5cm circles. Bake in the preheated oven for 20 minutes. Leave to cool and then sandwich two biscuits together with the hazelnut ganache, you can use the same piping tip as you used to pipe the biscuits, or you can just spread the ganache with a spoon. Store in an airtight container, the biscuits will keep for about 5 days. Thanks for reading and don’t forget there’s still time to enter my competition to win a matcha tea set. I’m off to go and read my autographed book some more! I was sent three baking trays by Utensa Ltd to try and review fairly. All views are my own and I was not paid for this post. I’ve added these to Fabulous Foodie Friday. I absolutely fell in love with Viennese Whirls when I vacationed in Ireland, and could not find them ANYWHERE in the US, it was about the saddest thing ever. So I ended up making my own which were about 89% as good as the ones I had in Ireland! But now I have to try these chocolate ones because…YUM! Ah Nicole – it’s so cruel when you try food on holiday and you can’t get it back home. I’m so pleased you like this chocolate version, they are really tasty. I’ve just made these. They look beautiful but aren’t as chocolatey as I’d hoped. I think more cocoa is required. Also, there was way too much ganache and although it piped straight from the fridge, it hasn’t kept it’s shape and is now oozing out. Hi Lou, I’m really pleased that you made something of mine, but I’m sorry you weren’t happy with the results. The amount of cocoa is just down to personal taste. The majority of the chocolate flavour should come from the ganache, but feel free to add more if you want, adjusting the flour where necessary. I haven’t played around with the amount of cocoa, so I can’t say how it would affect the final bake. There shouldn’t be too much ganache as you can fill the biscuits with quite a lot when it is pretty firm. It seems that the ganache was still too soft/wet it should be quite firm to pipe and cool, as thick as whipped cream or for a spoon to stand in it, but not as hard as for hand rolling. Can I ask what chocolate you used to make these and how long you left the ganache in the fridge? Thanks very much for taking the time to comment and letting me know how you got on. Now this is very dangerous! I have bed led here by Kim and think I may never leave – all these amazing things to try! Hello Colleen, Kim is a very kind guinea pig of mine 🙂 I hope you like the blog, it’s lovely of her to share it around for me! Do you do a lot of baking? Hi Alex, Thank you very much for your lovely comments. I’m so pleased you like my blog! I had no idea that Utensa didn’t supply to the public – they contacted me via twitter, so I assumed they were available to the public. You can get their baking trays on Amazon. I do however recommend Lakeland baking trays, they’re really good and they don’t warp. If you wanted to make the filling, you could use a milk chocolate instead (Green & Blacks and Lindt are good brands). Or Waitrose make a hazelnut truffle chocolate, that you could use in place of the Amedei Gianduja http://www.waitrose.com/shop/DisplayProductFlyout?productId=287705. The last option, which I’m sure will work really well is this Nutella ganache http://www.cakeandallie.com/2011/07/chocolate-nutella-macarons/. These cookies look amazing! Love the swirl/rose look! I am not a fan of cinnamon, so I am all for the hazelnut ganache! I am sure they won’t last long in my home! Thank you so much! I do like cinnamon, but I think it really can overpower stuff sometimes or make it taste too much like Christmas! Thanks again and have a fantastic weeekend. 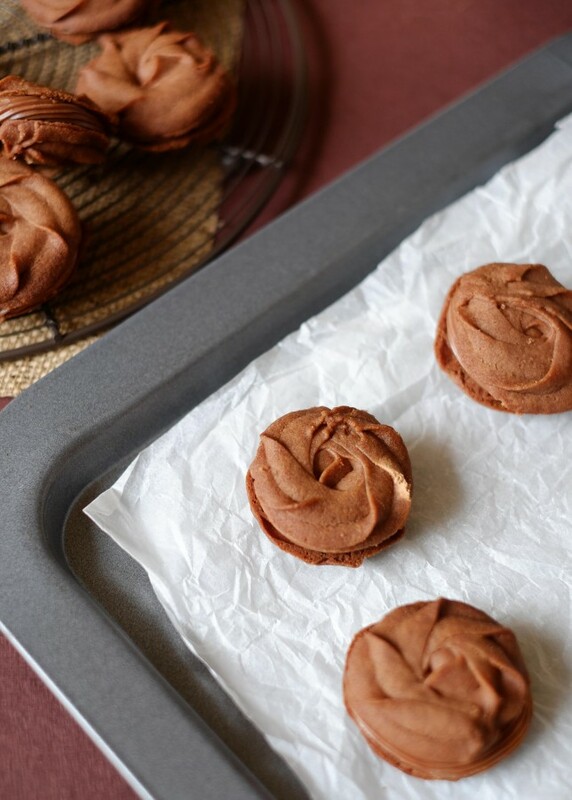 These look so good I love the texture of a Viennese whirl and these look perfect. I’ve never attempted to make them before maybe I will have a go. Sammie, thank you so much for coming and taking the time to comment. I’m pleased you found me on twitter and I’m glad you like the Chocolate Viennese Whirls. I am so pleased that they sent me a copy of their book, I hope that you can learn lots of my blog and if you try anything, let me know. Thanks so much Hannah. I’m glad you like them. The hazelnut ganache is amazing, I had to stop myself eating the chocolate! Thanks so much Hannah. If you like hazelnuts and chocolate you should try gianduja (if you haven’t already). It’s really delicious, you can get it in spread and in bar form. I love the stuff! Gorgeous whirls Angela – and gorgeous photos ; ) They have so much more impact used vertical. The one used in the recipe bit is my fave. I have yummed them – or is it yummlied? In any case I wish I could eat some. You’re right, shot vertically they do look much better. I like the one in the recipe too, but for some reason, used large, it just didn’t work for me. Thanks for yumming, yummlying or whatever the word is! They taste so delicious and I love that you could use pretty much any filling you want.